Due to rain overnight, Central Park and NMBSC games will be on an hour delay this morning. Please be prepared to star promptly at 9:00. This delay is for NMBSC and Central Park ONLY. All other complexes are starting on time. Thank you. 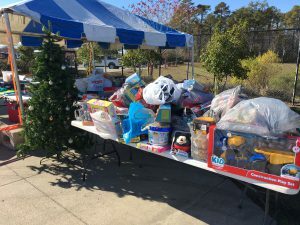 This year our Annual Toys for Tots Fundraiser was held on December 10, 2017 in Myrtle Beach, SC. Unfortunately mother nature was not on our side, so we had to move the event to Sunday. 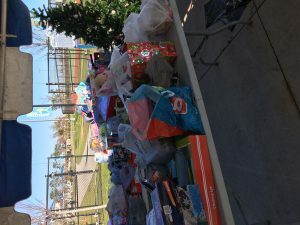 We had quite a few teams that did not play on Sunday however even with that, we collected over 515 toys!!!! We are so grateful to our teams for helping this great cause. 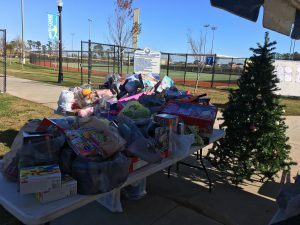 The toys were donated to the Toys for Tots chapter here in Myrtle Beach on December 13, 2017. This was a fun event and our favorite way to end the season. Thank you to all the teams that played and thank you to all of you for playing the 2017 season. We hope that everyone has a very Merry Christmas and Happy New Year. See you on the field in 2018!!! 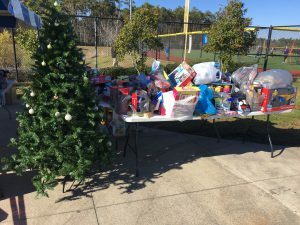 World Fastpitch Connection held our annual National Swing for a Cure softball tournament in Walterboro, SC on October 14-15, 2017. This year, this tournament touched home more than ever for our WFC staff as this awful disease has affected us greatly in the last year. 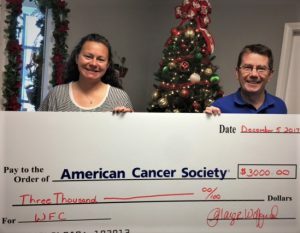 Proceeds from the event were donated on December 5, 2017 to the American Cancer Society. This year, WFC donated $3,000!! The teams were decked out in their pink everywhere and tournament t-shirts sold out again!!! We had a special first pitch ceremony for some breast cancer survivors as well as recognizing those that lost their battle. WFC is beyond grateful to our teams for their support during this event and we will continue to reach for higher numbers each year. We hope that everyone has a wonderful holiday season and thank you again for helping us raise this money. WFC would like to say a huge thank you to the teams, umpires, and staff that made this possible!!! The new sanction year has begun so please make sure that you get your team registered. Click here to fill out the form and then once you click submit, you can pay online or mail payment to the PO Box at the top of the website. Congrats to our teams that made it to Championship Saturday! Thank you to everyone who played this week! 18u please note there was a typo on the pool schedule. The 11:10 games for Wednesday will be on fields 5,6,7, the same ones we have been playing on. Here are today’s pool play results. Winners are highlighted in blue. Please remember an error on here could be a typo so please be sure to check your scores at the field.